Once again, a license plate is responsible for controversy in the South, but this time it's not over a clever joke in Virginia. This time it centers around the darkest chapter in American history and the ugly legacy it brings up. 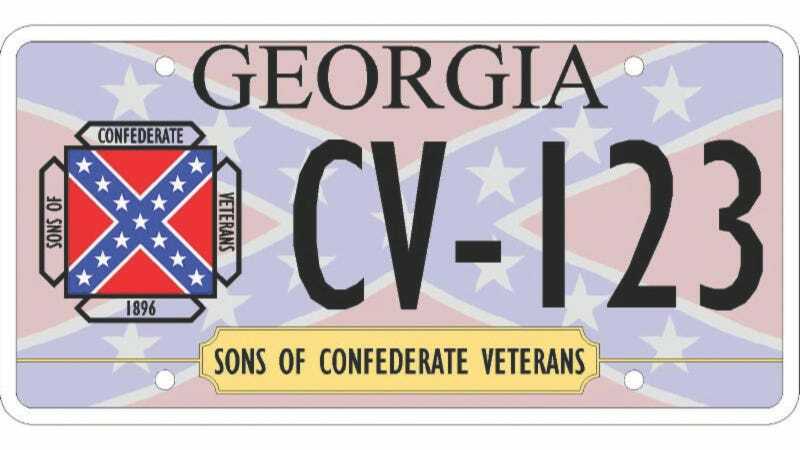 The Atlanta Journal-Constitution reports that Georgia is releasing a new specialty license plate that features the Confederate battle flag, a move that has already infuriated civil rights advocates. Those in favor of displaying the Confederate flag say it's a celebration of heritage, but opponents, especially black people, see it as a reminder of a war fought and lost over human slavery and the decades of Jim Crow laws and segregation that followed it. A spokesman for the Southern Christian Leadership Conference said Tuesday that the state should not have sanctioned the battle emblem to appear on a Georgia tag. "To display this is reprehensible," said Maynard Eaton. "We don't have license plates saying 'Black Power.'" For their part, the Georgia Division of the Sons of Confederate Veterans said it meant no offense. People have a right to commemorate their heritage, and the state would be discriminating if it rejected the group's application, said spokesman Ray McBerry. "By sanctioning the plate, they are not saying they agree with our organization. They're just saying it's a level playing field," he said. The new one is drumming up controversy, but Georgia has had a Confederate flag plate for a while. This plate replaces an older version, of which more than 400 were sold in the last two years. Georgia law prohibits vanity plates that ridicule any race or ethnicity, the newspaper says, so the old one must have passed muster at some point. Georgia isn't the only state that has a Confederate flag available on license plates. The AJC notes North Carolina, Alabama and Mississippi have such tags available for specialty groups, although Texas rejected them on the grounds that some might find them offensive after a big legal fight. We'll have to wait and see what kind of battle follows this one.